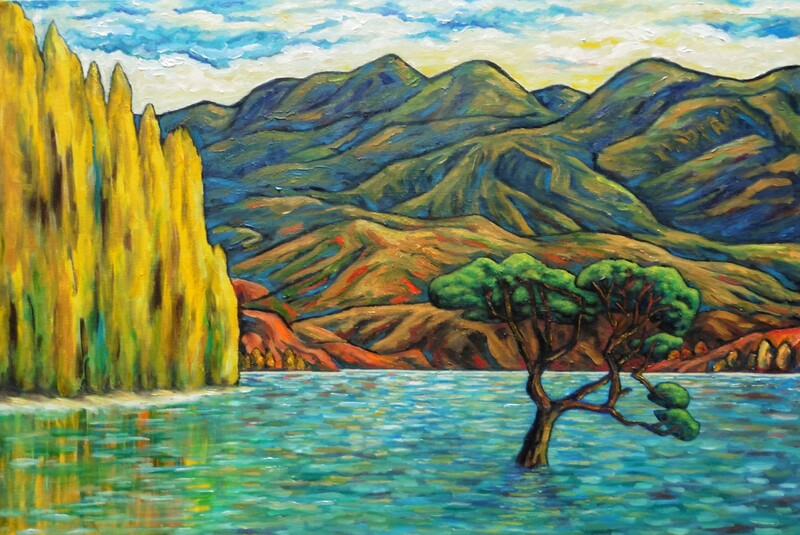 My first painting of the Lake Wanaka area. A small willow tree in the lake, sprouted from a post and wire fence of 100 years ago which prevented sheep from wandering off the farm to visit town. Following promotion by local tourist agencies, #thatwanakatree is recently global on instagram and is now over-run and damaged by people climbing all over it for selfies – a bit like 10,000 spoons when all you need is a knife (… or not much like that at all, as you prefer). Your painting is so magical, Alistair. I’m sorry to hear the “humans” can not respect the trees space and privacy. Thanks Sharon, it’s a curious thing in that the local tourist body promoted it and now can’t control the result, careful what you wish for syndrome! The painting is beautiful and I love the fortitude of this tree. Well deserved recognition and congratulations. It is a beautiful image with a strong sense of place so I can see why it is appealing on both counts.